Create team memories that will last a lifetime with a Nike Soccer Tour to the birthplace of the game. Explore famous English cities and the history of “football” at iconic landmarks and stadiums. 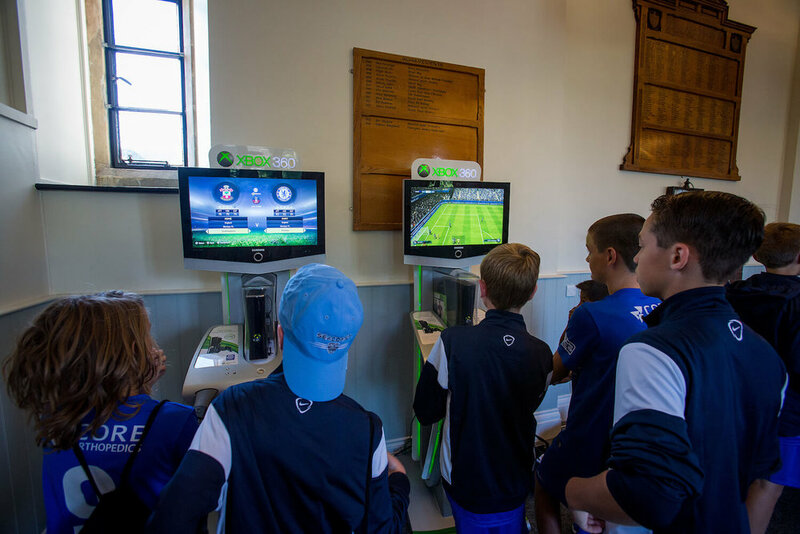 Play matches against local competition, watch professional English league games, even opt for training sessions and masterclasses delivered by our Nike club partners - Brighton & Hove Albion FC. We will design a completely customised tour, working with you to create the best itinerary for your budget and wish list. England is our most popular destination for soccer tours but we can also offer tours to other European countries. Contact us to discuss your requirements. Nutrition and hydration, psychology, strength and conditioning, and recovery. Go behind the scenes at England’s most famous sports stadiums. Structured program including Mini-Olympics, team building and group challenges. One of England's great private schools in a breath-taking location on the south coast of England with accommodation, training and recreation facilities on-site. Just 15 minutes from Brighton and an hour from London the college has a reputation for academic and sporting excellence and has a wide range of sports facilities. Home of the English FA, all 28 national teams and the Nike Academy, St George’s Park is England’s best elite football centre set in 350 acres of Staffordshire countryside with a Hilton hotel on site. The £105 million facility includes 13 outdoor pitches and a full-size 3G indoor pitch. Stay at the YHA Hotel, Brighton, in the centre of the city and train at the nearby Premier League Club’s category 1 academy facility, one of the best in the country. This option provides the best of city life plus access to great football facilities. Subject to availability, we can offer a professional coaching programme with Brighton and Hove Albion Soccer Schools. Brighton and Hove Albion FC are an English Premier League club with outstanding facilities including a Category One Academy and one of the largest community coaching programmes in England. They have a reputation for excellence in youth development. The coaching programme will be modelled around the requirements of your group and delivered by their award winning coaching team to fit the schedule of your tour. With this option we supply you with the equipment and facilities you need to run your own training programme for your group and will work your training programme into the tour schedule. Using our extensive network of contacts across the country we can arrange matches for boys and girls across all junior age groups against local and professional clubs. We work hard to ensure we find the right level of opposition for your group, arranging home and away matches during your stay. With plenty of scheduled social time after the match, players get the chance to interact with young English footballers of the same age, making new friends and learning about English youth soccer. We have links with some top Sports Science Universities and can offer workshops or seminars on nutrition and hydration, strength and conditioning and recovery. Sports Science seminars offer a break from on-field training while still providing valuable insights to assist with all-round athlete development and progress on the pitch. Our staff have years of experience running kids camps and tours. You can choose to have a fully-supervised tour with a welfare team looking after the players, leaving you with more free time. Alternatively, just have an on-site tour manager ensuring all the logistics run smoothly throughout your stay. With our fully-supervised programme our welfare team will organise and lead a programme of evening activities to keep players entertained even in their free time. From football-tennis to quiz nights, we can organise activities each night to keep energy levels up and the team experience going strong. With many years’ experience organising all kinds of trips to a huge range of attractions across England, we will use our extensive knowledge to help you to choose the most relevant, interesting and fun excursions for your group. You can focus on sporting attractions or visiting some of the sights in England’s most famous cities, or both. Explore landmarks such as Buckingham Palace, ride the London Eye and visit Niketown on the famous Oxford Street. Go behind the scenes at England's top stadiums such as Wembley Stadium, home of the English national football team. Seaside and city! Enjoy games at Brighton Pier and explore the history and culture of this forward-thinking city. We can arrange tickets to professional matches in the English Premier League and Championship League during the football season. We will work together to establish the best games to fit with your schedule and budget. Please note that we are only able to arrange tickets to pro-games during the season, which runs from August to May and tickets are subject to availability. Games sell out fast! Sports Tours Europe is a trading division of CMT Learning Ltd. Nike Tours are operated by CMT Learning Ltd in the UK. Nike and the Swoosh design are registered trademarks of Nike, Inc. and its affiliates and are used under license. Nike is the title sponsor of the camps and has no control over the operation of the camps or the acts or omissions of CMT Learning.